Oh no! I can't believe I'm going to say this. I was not crazy about this month's Paper Pumpkin kit. Just not my style at all. However, a lot of the components that came in the kit were simply adorable, and they were begging me to play with them. To answer the call of the kit components, I proceeded as follows. Basically, I grabbed two of the card bases, the lime green/white and the black/white stripe, and sliced them in half. Using only one half of each of the bases, I proceeded to cut these into 3/8" strips. I'm sure it's obvious what I did with these strips. Yup! I wove them together to make a completely new-looking background. I wanted to show off the looks of my woven background, so taking that into consideration, I was careful about finishing the card. In black ink, I stamped the "celebrate" from the cool Calligraphy Essentials stamp set on page 11 of the new Annual Catalog. After fussy cutting a whimsical border around the word, I mounted it onto a piece of black cardstock, then mimicked the fussy cutting to give a good border so it showed up well enough against my busy woven background. I added bright pink polka dots to the wider portions of the letters. Hmmm. What are we celebrating?? Oh yeah! A birthday! So I grabbed one of the diecut birthday cakes that came in the Paper Pumpkin kit, added a sticky-backed candle from the kit and colored the flame of the candle in the same pink. The cake was mounted onto black cardstock, and, once again, the black was trimmed to leave a border around the cake. I popped up both the sentiment, as well as the cake with Dimensionals. I also added three of the adhesive-backed sequins from the retired Occasions Catalog. However, they seemed a bit lonely. So I grabbed my paper punch, and from the excess surrounding the "hooray" stickers that came in the kit, I punched two shiny gold "sequins", which I added to the cake and the upper left hand corner of the card. Unfortunately, no matter which way I positioned the card for its photo shoot, I could not get them to look anything other than black. Really. They are shiny gold. Do any of you subscribe to Paper Pumpkin? If not, check it out by clicking on the button on the right side of my blog! This is a very important post. Really. You see, it is my 700th post! Can you believe it!?! Also, I am introducing to you a wonderful stamp set, All the Good Things, which can be found on page 151 of the new Annual Catalog. I love this set. As soon as I saw it, I put it at the very top of my Wish List. My husband and I have a history with koi. I'd been seeing other stamp companies come out with koi stamp sets, but I'm glad I waited until Stampin' Up! released one of their own, because it is exquisite. Two of the stamps in this set come with the sentiments attached to the image. The large koi and the bonsai tree were both like that. Since I don't always want to use a sentiment with my images, I simply carefully cut off the sentiment so the sentiment and the image can be used separately. I feel that this gives me even more options with a stamp set. At the end of this post, I will tell you a story about why I love koi so much. To make the watery base for my card, I crumpled up some of the pretty turquoise tissue paper that comes inside our Paper Pumpkin boxes each month. It is such a lovely shade and makes for exquisite water. The Faux Silk technique, which is how this water environment is created, is so much fun to do and is really quick and easy. You can find a few of my other projects utilizing this technique HERE, HERE, HERE, and HERE, just to give you a few examples. I love this technique so much that it shows up in my blog posts and my Stamp-In Classes on a frequent basis. I finished up the water by adding sponging in the new ink color, Balmy Blue. I made the sponging heavier in places to add a bit of depth and "real-ness" to the water. To make the koi, I stamped in Memento Tuxedo Black ink the large koi once and the smaller koi twice, on varying shades of orange-y cardstock. I then fussy cut the fish and glued them in place in the water. If you've ever watched koi swim -- for example at a botanical garden -- they swirl around each other in such a peaceful and graceful fashion. I tried to mimic that in the placement of my koi. Also, koi come in a huge variety of color combos of oranges, white and black. So, to add a bit more realism to my fish, I added some areas of white gel pen to them. Since I meant for this card to be more of an art piece, I decided to forego a sentiment of any sort. I just wanted the tranquility of the scene to speak for itself. In fact, I don't plan to send this card to anyone, so I'm not even sure why I made it into a traditional card. I did add some Wink of Stella to my koi, but that was terribly difficult to capture so I could share the look with you. The following photo, I suppose, does it the most justice of any of them I managed to take. Are you ready for my koi story? At the house we lived in until three and a half years ago, we had a gorgeous waterfall built into the downhill landscaping in the back. We had water plants, a little metal guy "fishing", rocks, plantings alongside the waterfall. To finish it off, we had three koi in the top pond. They loved their environment. It was all so beautiful. One of the koi we purchased when it was quite small, only about five inches long. He was gorgeous, similar in coloring to the large one on my card. Each fall, we would bring him inside the house and let him live in a giant Rubbermaid container, complete with pump, heater and all the accessories to keep him healthy and happy throughout the cold winter months. The other koi didn't last like this guy did. So, we were thrilled when, each spring, we were able to re-introduce him to his new outdoor environment. I think we did this three winters. After these three years, he measured about two feet in length. Our treasure. We'd also added two other koi to join him each spring. They never made it through the season, but our big guy always did. One summer, when he was about three years old, there was a loud ruckus in the middle of the night. My husband went outside with a flashlight to check on what was going on. All he found were three fish heads lying in and around the water. The raccoons had had a feast. He saw them waddling away off into the woods. We were simply heartbroken, especially at the demise of our big guy. From that time on, we put no more koi in our pond. That area was never the same again. So, this card is my tribute to our long-gone koi. 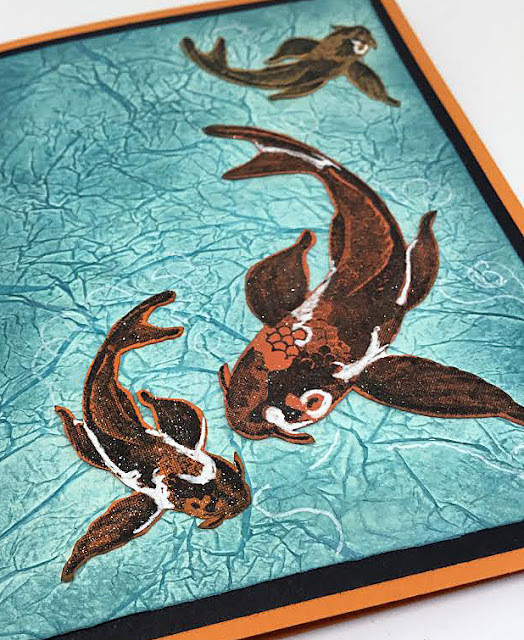 One last mention: The koi in my card actually show up as way more orange in tone than my photos reflect. So, picture them in real life as more orange than black as depicted here. Boo hoo. The last week or so, my daughter, Sarah, and I were horrendously busy getting ready for a village-wide garage sale at our home. Needing somewhere to display all our goods we had for sale, I lost all my work tables from my Creation Station. Boo. On Saturday evening, after the sale was finally over, I got two of my tables back. Whew. Too tired and crabby at this point, however, to do any Creative Therapy. But at least, I had a work space. Yay. Sunday, however, was a different story, and I was ready and raring to get some creating done. And what did I have a hankering to do? I am in love with hydrangeas -- can never get enough of these beauties! -- so grabbed an old hydrangea stamp and embossed it in gold on Whisper White cardstock.. In my card, I feature several of the new Stampin' Up! colors. A beautiful color combination for some hydrangeas includes blues and purples. So . . . The flower portion was carefully sponged on with Balmy Blue and Highland Heather. For the leaves, I combined Granny Apple Green and a new In Color, Call Me Clover. I have discovered that the ink in the new ink pads requires a bit of care when it comes to sponging. To make a smoother transition between colors and within the colors themselves, after I ink up the sponge, I tap it quickly and lightly on scrap paper before taking it to my good cardstock. I didn't want a definitive break between the colors of the flowers and the leaves, so I crept a little of the colors as invaders into the "wrong" space. The emboss resist piece is matted on a layer of Call Me Clover cardstock. 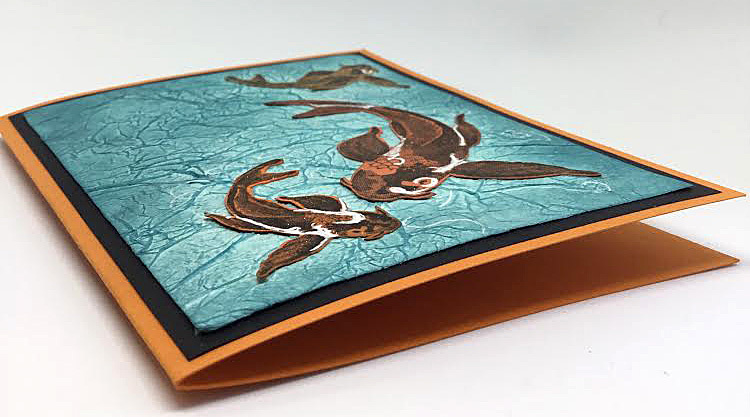 The card base is made from the yummy Balmy Blue. Matted onto the blue base is a piece of Designer Series Paper that complements my color scheme and offers a subtle graphic interest. Not a lot of dimension in this card. The diecut love is adhered directly onto the oval that frames the flower and adds some separation in the large sponged space. Thus, the only real dimension comes from adding Stampin' Dimensionals to the matted main piece before adhering it to the DSP. To get the oval frame, I nested two sizes of oval dies together on top of the gold brushed metallic cardstock. I then used sticky notes to hold the dies in place to ensure a frame with an even edge, then ran it through the Big Shot. It worked really well. And I love the way it still allows the main piece to be completely sponged, but yet separates the flower itself a little to increase the awareness of the hydrangea as the focal point. If you ever have any emboss resist questions, please ask me! I love this technique, and I'd love to get others obsessed about it too! 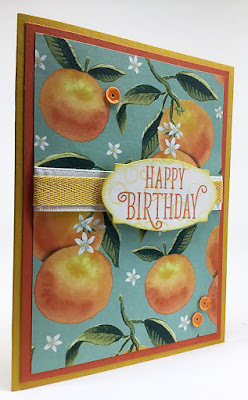 Today I have for you a fairly easy card, one that spotlights a few new Stampin' Up! products from the Annual Catalog that went live on June 1. The stars of the card include the darling stamp set, Love What You Do, which can be found on page 177. Also featured are inks in two of the new In Colors, Blueberry Bushel and Pineapple Punch. I love the combination of the two colors, a medium blue and a very appealing yellow. I've seen lots of cards created with this stamp set. I find that the flowers are usually colored in somehow, either with the smallest blotch stamp from the set, or handcolored in some fashion. I, on the other hand, chose to utilize the flowers in their sheer simplicity of line art. 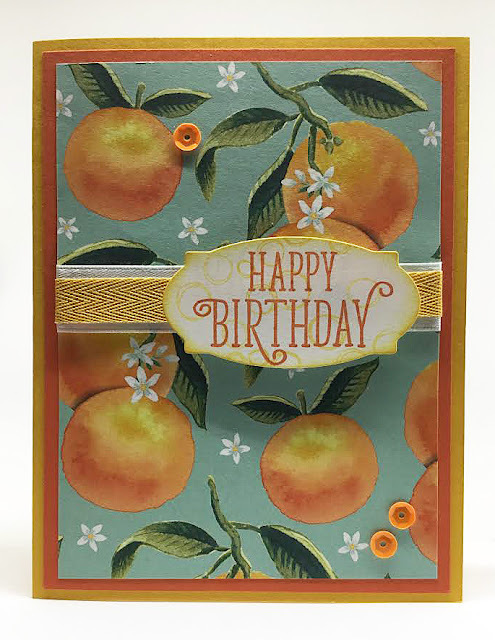 Keep reading for the Supplies List and Instructions to re-create this easy, but standout card. Fold a 5 1/2" x 8 1/2" piece of Blueberry Bushel cardstock in half, creasing it well with a bone folder. On a 4" x 5 1/4" piece of Whisper White cardstock, randomly stamp the open berries branches in Blueberry Bushel ink -- STAMPING OFF ONTO SCRAP PAPER FIRST! Fill in the empty spaces of this piece with the solid berries branches in Pineapple Punch ink -- DON'T STAMP OFF FIRST; OTHERWISE THIS COLOR IS TOO LIGHT. Stamp the large splotch in full strength Pineapple Punch ink onto a 2 3/4" x 3 1/4" piece of Whisper White cardstock. Over the yellow, stamp the trio of flowers in Blueberry Bushel ink. Adhere this piece to a 3" x 3 1/2" piece of Blueberry Bushel cardstock. 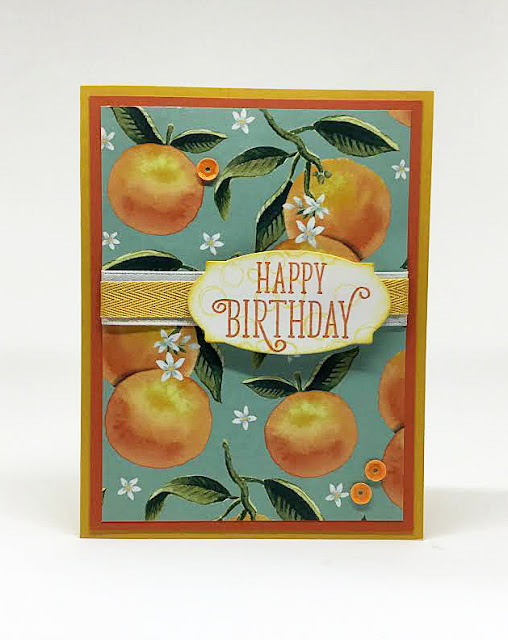 Using Stampin' Dimensionals, attach this piece to the card, lifting it up a bit from the center point. Add three blue dots to the background. There are cardmakers who always always always put a sentiment on the front of their cards. Personally, I have a love/hate relationship with the presence of a sentiment gracing the outside of the card. Especially if you are making cards to sell. What if you'd put "Happy Birthday" on the card front? Your customer loves the card, but was hoping to find one that instead said "Thinking of You". So she walks away. If you leave the outside blank and let the gorgeous-ness of the card design sell itself, the buyer can add personal sentiments and notes inside the card before sending it out. That way, it says EXACTLY what she wants it to say. Well, I am looking for opinions on this subject in this post. I made a card two ways: one with an outside sentiment, one without. Lots of nice dimension on this card due to the fussy cutting I did and adhering the fussy cut pieces with Stampin' Dimensionals. Think about it: When creating a card, do you add a sentiment to the outside? Or, when you're looking to purchase a handmade card, do you look for one that is for a specific occasion, thus featuring the sentiment on the outside of the card? Or, doesn't it matter -- if the card is right artistically for the occasion you have in mind, and doesn't have a sentiment on the front, do you prefer that? I seriously would love to hear some opinions and/or discussion about the presence of a sentiment on the front of a card. It seems like sort of a trite subject, but as I noted earlier, I truly have a love/hate relationship with this quandary. Let's hear your thoughts!